My name is Barbara Lang-Lyras Auffret, author of an upcoming book to be entitled, “Heroes of the World Trade Center, No Greater Love”. I am the daughter of retired NYPD detective, George J. Lang and the niece of retired FDNY firefighter Charley Lang. 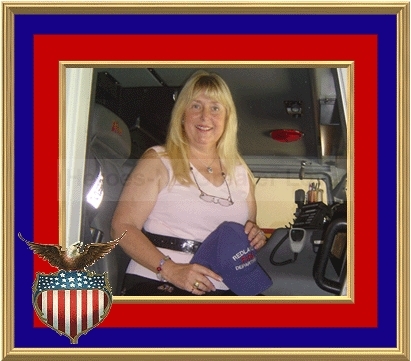 I was the first female P & I Representative for the Clubs in London which was centered at the WTC, the North Tower. Just a year before the towers fell, my husband Raymond and I were married onboard the yachts just below the towers and our wedding party stayed at the Marriot WTC Hotel. We wish to pay our respects to the manager of that hotel who took care of us and has made the ultimate sacrifice. He was there with the Firefighters from Ladder 118 in Brooklyn including, Firefighter Scott Davidson, who's photos will be in our book with a statement from his dad, Steve. Just under 100 firefighters lost their lives in building #3 that day. Their story will be told by a brave heroic elevator manager, Bobbie Graff, who himself was buried and managed to survive. He wants to make sure that everyone knows how heroic and brave they were there that day and how thankful he is to them. This book contains stories of the brave and courageous acts of those men and women, both civilians, and those working for the City Agencies: Fire, Police, Transit, Sanitation, the State Office of Court Administration, etc. who both survived the collapse and gave the ultimate sacrifice on 911. The book is divided into several chapters. It begins with the Forward by Chief George Pickett (Retired FDNY), author of the newest popular book about the FDNY, entitled, "The Brave"
It then moves into a great introduction by Major Alan G. Martin, from the New York State Police, Troop F, who is a photographer in his heart and soul...He has taken photographs of the Towers in their Prime, shinning in the moonlight, as they appear to be floating, majestically, in the air high above.. The first chapter is dedicated to the heroes. I am asking for YOUR DEFINITION OF HEROISM. Many people and organizations have written from their being... and years of experience.. defining what a hero means to them, including some the families of those lost. I would ask all those who join us at this site and would like to participate in this project to submit their definition which we will consider for publication into this book. As we all remember, 911 has so many facets and still continues to manifest itself in so many different ways. For that reason, another chapter of this book will contain the stories of those individuals who went out of their way, beyond the normal “I’m sorry”, to show their love and compassion for another. Many of them have created organizations, to help those afflicted, to designing a piece of art work so that their memory will live on. ALL THESE THINGS MUST NEVER BE FORGOTTEN!